This gas dryer ignition coil set comes with two ignition coils: one three-terminal boost/hold coil, and one two-terminal secondary coil. 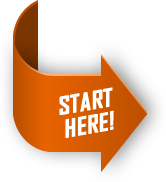 If there is no heat or your drying time is getting longer, the coils may be bad and will need to be replaced. Once the coils go bad they do not hold the gas valve open properly. Usually only one of them burns out but you should replace them as a set. Both must be operational for the gas valve to open. This is a genuine OEM part. Please remember to disconnect the power to your dryer before starting the repair. The door catch helps keep the door closed while the machine is running. If your dryer will not start or the door will not close you may need to replace the door catch. 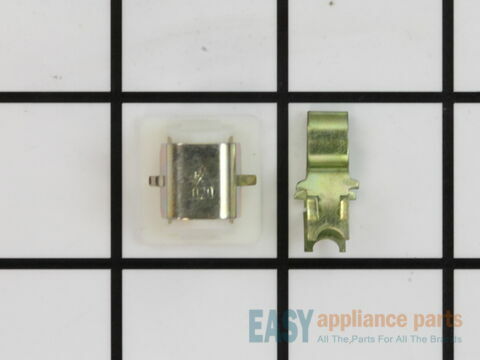 This is a genuine OEM part and includes both the male (strike) and female (catch) pieces. Please remember to disconnect the power to your dryer before you start the repair. 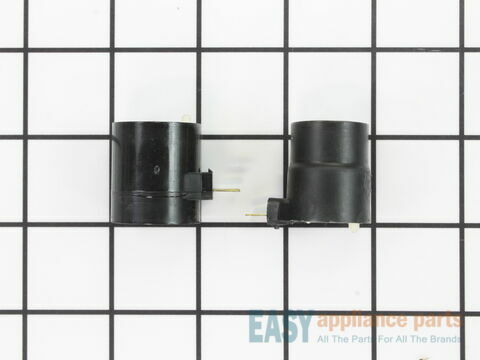 The cycling thermostat with internal bias heater will continually cycle the heating element off and on to maintain a constant inner temperature in the dryer. This cycling thermostat has a limit of 155 degrees Fahrenheit and a differential of 25 degrees. Meaning that the heating element will cut out at 155 degrees and cycle back on once the internal temperature drops by 25 degrees. This is a genuine OEM part. Please remember to disconnect the power to the dryer before starting the repair. The tri ring is used to hold the drum support rollers or the idler pulley onto the shaft. 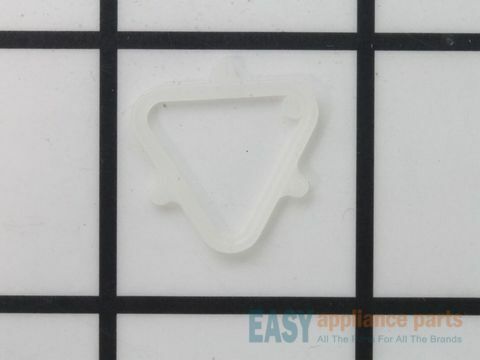 If your dryer will not tumble or is noisy, you may need to replace the tri ring. This is a genuine OEM part and is sold individually. 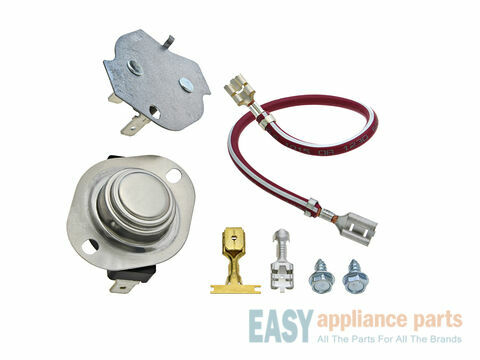 This thermal cut-off kit for a dryer includes one high limit thermostat with a limit of 250 degrees Fahrenheit, and one thermal cut-off fuse (309 degrees). The thermal cut-off (fuse) is meant to trip at a higher temperature than that of a high limit thermostat. This is a one-time use fuse, so when it does trip, you must replace it. 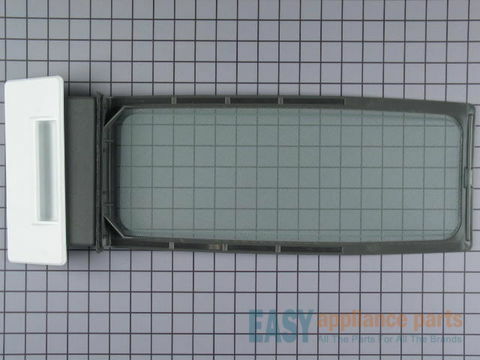 The hi-limit thermostat acts as a safety mechanism that keeps the dryer from overheating. 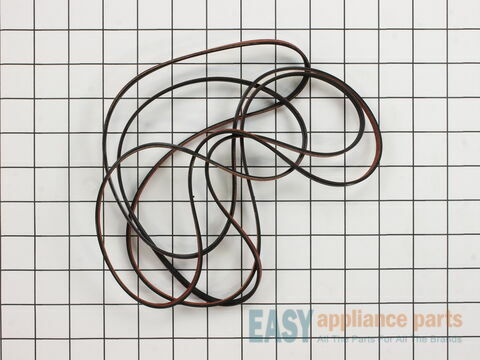 Once the dryer temperature reaches a certain point, this piece will shut down power to the heating element. This genuine OEM kit also includes flat heaters with jumper wires. Make sure to disconnect the power source to the dryer before beginning this repair. 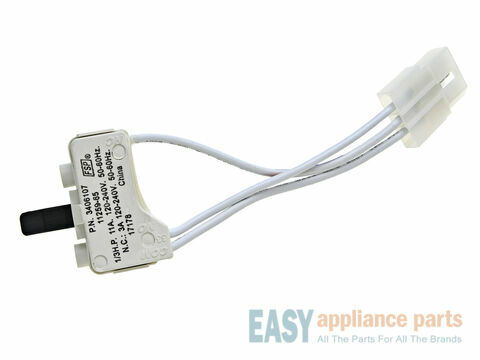 This 3-wire with leads dryer door switch is an on and off mechanism that prevents the dryer from operating while the door is open. The dryer will not operate until the door switch signals that the dryer door is closed. 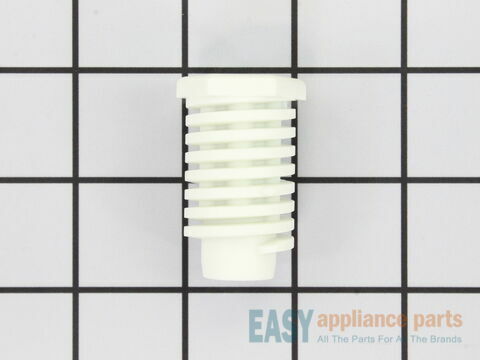 If the dryer won’t start, the lever broke off, or the switch shorted out, the appliance will not operate and the part will need to be replaced. 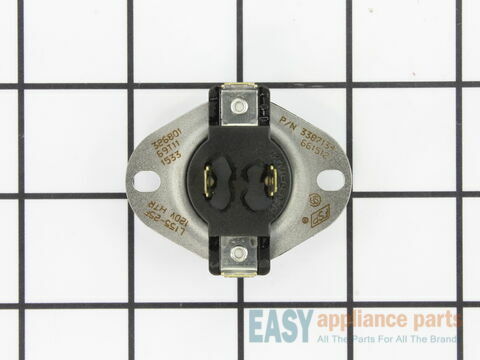 This switch is a genuine OEM part and replaces the 2-wire switch. Please remember to disconnect the power to the dryer before starting the repair. The lint filter with handle is used to collect lint and debris as it passes through the dryer vent. It is recommended to clean the lint filter before every load. If your dryer takes too long to dry you may need to replace the filter. This lint filter includes a white handle and measures approximately 23 inches including the handle. This is a genuine OEM part. 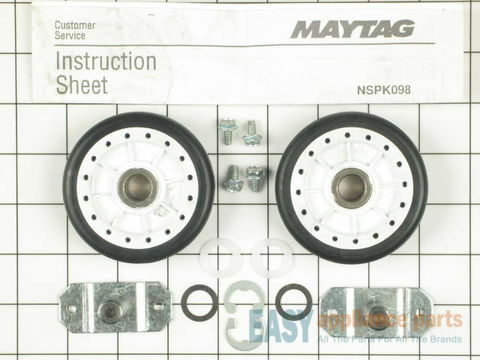 The rear drum support roller kit includes two drum support rollers, two support shafts, four screws, two spacers, two washers, two retaining rights, and an instruction sheet. If the dryer is making a loud rumbling noise or will not tumble you may need to replace the roller. The drum support roller holds the drum in place while it rotates on the support wheels. Most dryers use two drum rollers, and it is recommended to change both at once. This is a genuine OEM part. Please remember to disconnect the power to the dryer before starting the repair. Below are the most popular Admiral Dryer models we have.